On the Pro Tour, where we encounter a new course every week, we have to learn as much about the course as we can before the bell rings on Thursday morning. Often, the most demanding assignment is to get a feel for the speed and break of the greens. 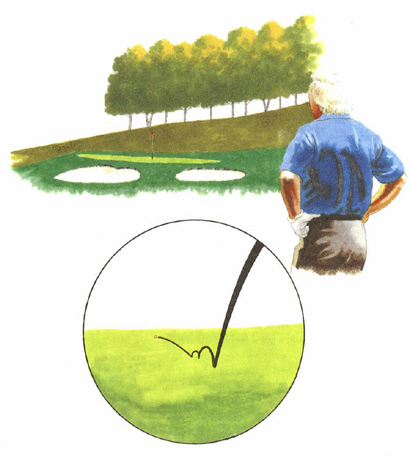 One trick I use - and recommend to you when you're playing a course with which you're not familiar - is to begin reading the green well before you reach it. Take note of its setting. If the green appears flat but the surrounding terrain slopes in a particular direction, the green probably will fall at least a bit toward the lowlands. You should also watch the behaviour of your approach shot, and those of your playing companions. Does the ball stop quickly or take a big bounce on landing? How fast and far does it roll, and in what direction does it curve at the end of its roll? All of these things will give you hints. Watch your companions' chip shots, too, but beware of paying too much attention to their putts. Bitter experience has taught me that each player puts a slightly different hit and roll on the ball, so I don't pay much heed to other guys' putts. But I do watch their other shots very closely.